App descriptions have differing purposes on the Apple App Store and Google Play Store. On iTunes, App descriptions are another tool that can convert visitors to users when a visitor is viewing your app page on the app store. An effective app description on the Apple App Store can convince the user to download your app. In addition to being seen by potential users, the description in Google Play is used by the app store for ASO purposes and keyword search results. In this lesson, we will show you how to write an successful app description in both of the app stores. The description of your app doesn’t matter as much on the Apple App Store for ASO purposes, but potential users will still see your app description and use it to inform themselves about your app's purpose. Remember to put the most important part of your description at the very top because this is what most people will see. In the picture below, notice that only the first couple lines are visible on iTunes for your app. This is referred to as the “above the fold” content. Uber starts off their description by emphasizing the primary use for their app: ridesharing and quick, fast rides. The description continues to describe the benefits of using Uber and tells the potential user exactly what they need to know about using the app. Make certain your description is easy to read and formatted in a nice way for your potential users. Make certain that your description is grammatically correct and written well, there are people who will read your entire app description to help them decide if they should download your app. A well-written description may be the final mechanism that convinces the potential user to download your app. Your short and long description for Google Play is where Google pulls keywords for your app from. You have 80 characters limit for the short description and 4,000 characters in your long description to write a natural-sounding description that contains your best keywords. Keywords in your short description have a larger weight than keywords in your longer description, so make sure to include your most important keywords in your short description. We recommend repeating keywords within your long description around 5 times, if you repeat keywords more than 5 fives it could be flagged by Google as keyword stuffing. While formatting your long description, make certain you format the description in an easy to read view, such as bullet points, so your potential users can easily read what your app is about. In the example below, you can see the description from Candy Crush Saga. Notice the formatting and how the keyword “sweet” appears exactly five times and appears in fluid, natural sounding sentences. Additionally, if you analyze this description further, you can see they mention "levels" and "game" numerous times as well. Candy Crush provides a good example of how to place many keywords within a long description on Google Play. They also included details about the game, social media URLS, and more to provide in-depth information about the app. Similar to the App Store, only the first couple lines are displayed above the fold on Google Play. Uber Eats is a good example of an app that has spaced out their above the fold text, which makes the app's description much easier for potential users to read. 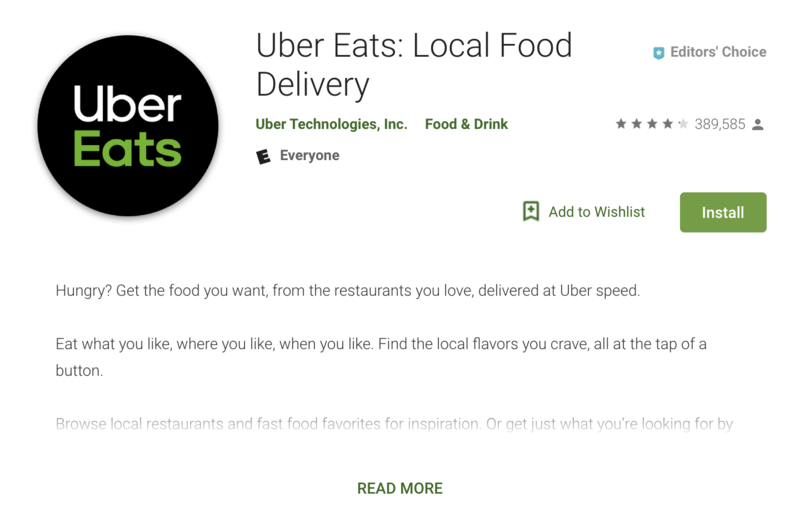 Even from this brief preview of its long description, Uber Eats included valuable keywords such as "hungry", "food", and "delivered". You may choose to use standard formatting below the fold, it is up to you. Once your app is found through keyword search, it's important to keep in mind that formatting and well-written long descriptions can help convert visitors to users. To test out your long description optimization for Google Play, only change your app description to measure the effect that the change had on your downloads. Since the long description directly affects your keywords on Google Play, make certain to monitor your keyword rankings after changes to your description, as outlined in Lesson 4. You want to have the best possible chance of getting your app downloaded and a great description can help turn potential users to actual users. In addition to convincing potential users to download your app, Google Play pulls in your keywords from your long description, which can directly affects your organic download growth. Just like anything else in App Store Optimization, be sure to test and track your changes on each app store. In the next lesson, we are going to show you how to possibly increase your download by 2X or more, by implementing one ASO strategy.